Data suggest that sentiment in the market has turned. I get the sense that the ice is breaking and we’re seeing a thaw in the property market. Sydney prices are down 26 weeks in a row, but unless APRA does something stupid (no guarantees there!) we should see things start to pick up from here. The key read on that right now is auction clearance rates. They were sliding lower, but now appear to have turned a corner. According to CoreLogic’s report this week, auction clearance rates were up to 70.5% from 69.1% last week, on similar volumes to last year. Clearance rates are still lower than they were at this time last year (when they were pretty high! ), but looking at the trends, its pretty clear they’ve turned a corner. That’s good news for the market. Auction clearance rates tend to give us a pretty good leading indicator of where the market is going. 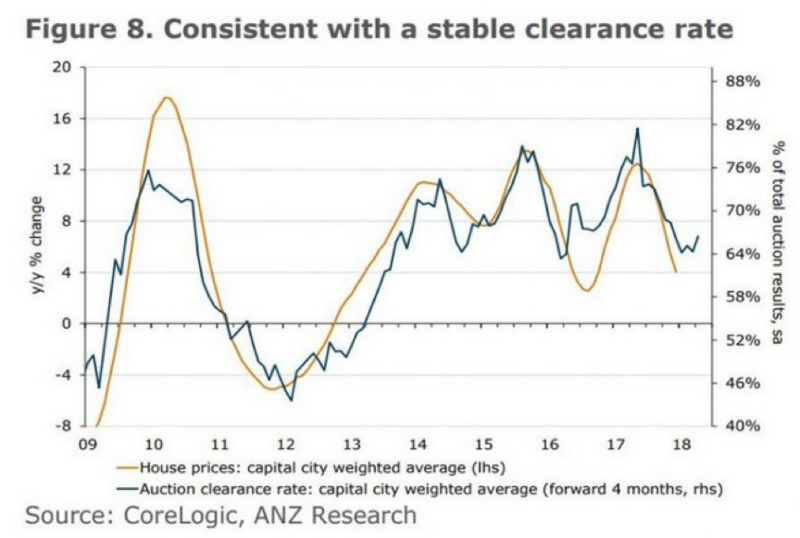 This chart here needs updating, but you can see the relationship between clearance rates and prices is pretty tight. So on these figures and recent performance, you’d have to think that overall price growth should settle around 4% per annum. That’s not quite as wild as some of the figures we’ve seen recently in Australia, but you have to remember that these were exceptional times. In a lot of countries, 4% would be a boom! 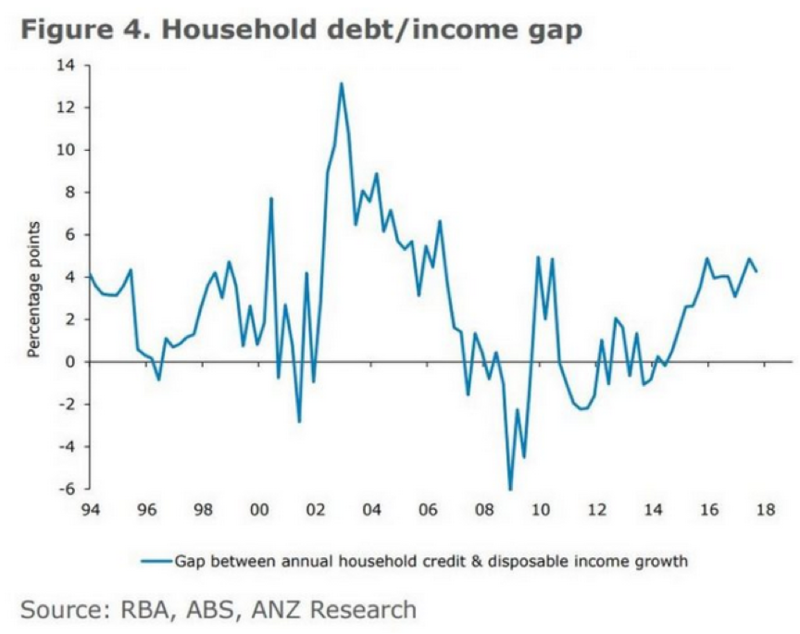 The other thing that makes me think that house prices are going to start accelerating is looking at what’s happening to household debt. On the whole, households got spooked by the GFC and started deleveraging in a major way – that is, they started paying off debt, and holding less debt overall. However, that trend seems to have run its course. Households have stopped paying off debt, and are in the process of taking on more debt. You can see that from this chart here, which tracks the difference between income and debt. 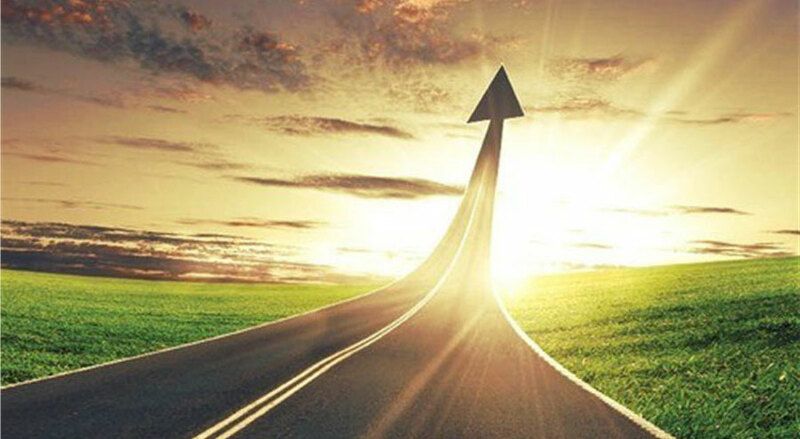 Higher readings mean that debt is higher relative to income. So you can see that reading has picked up in recent years, and is holding at modestly high levels. Note that we’re not talking anything like those crazy GFC days, but still, holding up. That means there’s still a healthy inflow into housing credit. Unfortunately, APRA is taking that credit impulse and distorting it, by artificially clamping down on the market and making the banks bend over sideways to get investor loans across the line. But the credit impulse is there. And I reckon it will remain there. 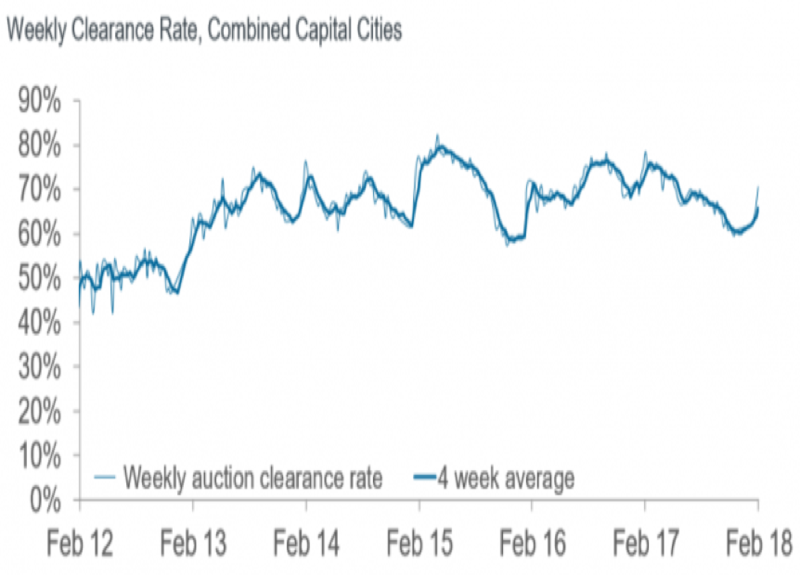 And with market sentiment turning, as evidenced by the pick up in auction clearance rates, this should help the market turn over all. See? You just can’t keep a good market down.